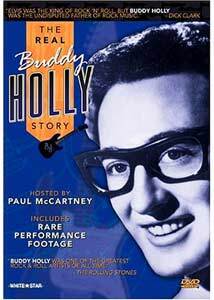 "It's my tribute to Buddy - The Real Buddy Holly Story. I hope you enjoy it." When Buddy Holly's chartered plane augered into a farm field in Iowa in 1959, killing the 22-year-old rock-and-roll star (along with Ritchie Valens and The Big Bopper), it marked one of the first dark moments in rock history, and it would eventually come to be known as the "day the music died", at least, that is, according Don McLean's music-as-history retrospective single American Pie. Even with a string of hits that just never seem to go away�That'll Be The Day, Everyday, Peggy Sue, to name just a few�rock historians have always wondered the great "what if.." Holly, a gangly guitarist with horn-rimmed glasses and a wavery twang of a voice, rose out of Lubbock, Texas in the late 1950s, and for just a few short years turned the music world on its ear, sending inspirational ripples of influence into bands like The Beatles and The Rolling Stones, which if you were to go no further would certainly be reason enough to justify deity status. The very first single recorded by The Beatles was a cover of Holly's That'll Be The Day, and so it seems fitting that Paul McCartney oversaw this BBC-TV produced 90-minute documentary some years back, serving as host and sometime narrator�though when it was made is unclear, but based on Sir Paul's appearance I'd guess late 1980s/early 1990s. As he indicates in the intro, this is an attempt to set the record straight, clear up some myths and paint a proper history of one of rock-and-rolls most influential acts, utilizing a blend of interviews with assorted family, childhood friends, bandmates and business partners, mixed in with some rarely seen performance footage and sound recordings of Holly. Aside from being a fairly solid historical retrospective, this is a really nice homage, without being overly maudlin or sappy. It covers his entire short life, from his high school days on through the legendary recordings made in Clovis, New Mexico (where we get a tour of the antiquated studio) that gave Holly and The Crickets their first dose of fame, and what would prove to be eternal rock-and-roll influence. All of the sometime glowing comments seem genuine, and not at all over-inflated, and even the bandmates he left behind in Lubbock when he took off for New York City in 1958 still have interesting stories to tell about him, with what seems like honest reverence. While some elements of Holly's life get quickly glossed over, such as the real reasons for his departure from The Crickets or what seems like his sudden marriage to Maria Elena, the historical chronology is generally pretty tight, and as we see him begin his rise to fame in the mid-1950s there is an inherent sadness because we already know that death awaits him in just a few years, at what could have been one of the most important phases of his career. Director Richard Spence sprinkles in enough Holly music, including a rarely heard 1954 demo tape, to gently remind viewers why all the recollections and stories seem so salient. In the media-saturated world of today, it is hard to look back now and fully realize just how ground-breaking Holly's approach to music was, or how jarring his songs were in those early days of rock-and-roll. This should help you get the picture a little clearer. Image Transfer Review: The 1.33:1 fullframe transfer leaves a little to be desired, even for a documentary. It's unsettling when the archival footage from 1958 looks fresher than the "new" footage, and though I'm not exactly what year this doc was originally made for the BBC (the case/artwork/disc are very vague), the colors for the interview segments have a very faded, washed out feel to them. There is noticeable color flicker and shift during some of the scenes, perhaps a result of the video transfer process. Audio Transfer Review: Audio is presented in a simple but effective 2.0 stereo track that provides generally clean, hiss-free narration, though some of the interview segments sound extremely flat, though I suspect it is probably an age-related issue. The occasional acoustic musical moments, such as Sonny Curtis' opening song or McCartney's strumming, sound fairly strong, however. Extras Review: No extras of any kind, aside from a healthy 27 chapter stops. A big name like Paul McCartney may head up this look back at the brief career and long-lasting impact of Buddy Holly, but it is the remembrances from family, bandmates, childhood friends and business partners that propel the narrative. Certainly worth a rental for music fans, which as a rock-and-roll history lesson it is fascinating stuff.